The aim of this project is to decipher the rules driving gene expression in the gram positive bacterium Bacillus subtilis. We developed a knowledge-based mathematical model of translation that we experimentally validated. We identified a unique global regulation, which is growth rate dependent and that apply to all proteins constitutive or not, and which is independent of any dedicated transcriptional regulators. In light of evolutionary constraints, we do believe that such global regulations are shaped to minimize cost in bacterial resources allocation. Synthetic biology enables advances in chassis design for biotechnologies. Bacillus subtilis is a GRAS bacteria (Generally Recognized as Safe) of industrial interest. 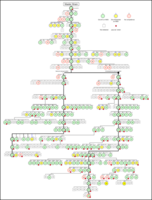 The genome engineering development for Escherichia coli has no equivalent in B. subtilis. 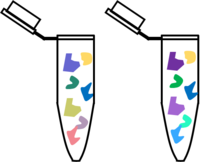 This project therefore proposes to develop new methodologies for B. subtilis, based on CRISPR/Cas9 (Clustered Regularly Interspaced Short Palindromic Repeat / CRISPR-associated protein 9) and recombineering (recombination mediated genetic engineering) to enable specific and controlled genome editing. 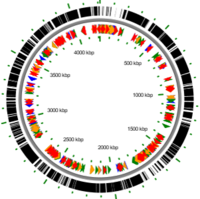 We have first identified the chromosomal dispensable regions allowing the genome reduction and the reduced strains have then been characterized. We were able to combine unmarked deletions / insertions and have engineered the chromosome of Bacillus subtilis at large scale. Synthetic genetic circuits often fail to function as designed because of unwanted interactions between circuit components and the host system. A promising strategy to foster innovation in biotechnology relies on the construction of adequately streamlined host strains. In collaboration with Carol Lartigue (BFP, UMR 1332 INRA / Bordeaux Univ, Villenave d'Ornon). We are currently developping cell free systems. Cell-free synthetic biology emerges as a powerful and flexible enabling technology. Cell free systems activates biological machinery without the use of living cells, and allows direct control of transcription, translation and metabolism in an open environment. Part of an ANR project in collaboration with J.L Faulon (BioRetroSynth, INRA), we aim at developing efficient production strains for flavonoids. Our study focuses also on the understanding of their mode of action on Gram positive bacteria. This project aims to develop a platform for the production of glucansucrases and glucopolymers by genome engineering and optimization of the culture conditions of Bacillus subtilis, an industrial bacterium with GRAS status. In collaboration with G. Véronèse (LISBP, Toulouse), and TWB. We aim to engineer systems to efficiently produce protein. Therefore, parallel and independent systems, as orthogonal expression systems, appear as useful tools to minimize undesired crosstalk between specific protein expression and cellular machinery. 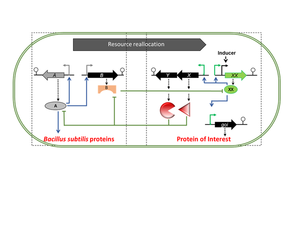 We will develop in Bacillus subtilis an orthogonal transcription system based on heterologous sigma factors.